Honest review for all free helpdesk support system, helpdesk ticketing softwares, web based helpdesk softwares! RT (Request Tracker) is a free, open source help desk software. This free help desk software is very well in handling email ticket and it’s has a web based interface which allow support team to access the ticket anytime anywhere. After testing the RT ticketing software, i found the most powerful part of this ticketing system is that support staff can reply and update ticket fully via email without logging into the web interface. 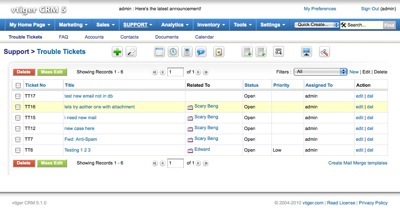 Furthermore, it also allow administrator to create custom field that is needed by your organization! vTiger is an open source CRM that come with Trouble Ticket module. The trouble ticket module turn this CRM system into a helpdesk system which able to receive trouble ticket through email. With some configuration, vTiger can be turn into a powerful helpdesk system. 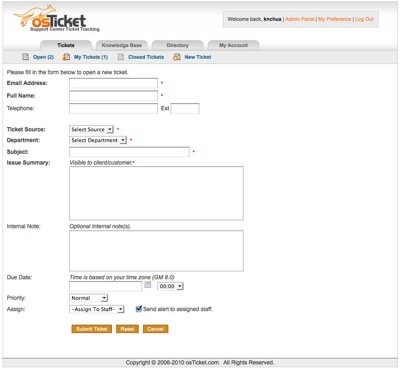 With proper configuration, vTiger is able to support auto ticket creation from email, auto ticket assignment, workflow for trouble ticket, Internal notes, tie trouble ticket to product, tie trouble ticket to customer database and lastly it allow you to generate reports! 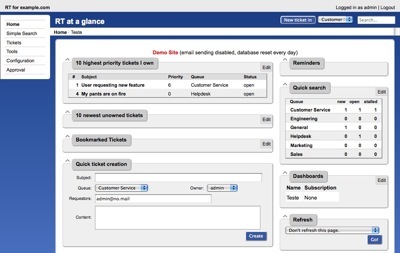 This free web based helpdesk system has a very similar interface like eTicket. Both free web based helpdesk system looks similar from the front but it has a totally different admin panel. osTicket come with a very simple interface but able to handle complicated tasks. It’s features include transfer ticket to different department, reassign ticket, canned reply, internal notes, email piping, knowledge base and more. The down side of this free web based helpdesk system doesn’t come with any reporting features. If reporting is one of your requirement, you may want to develop it yourself or you might want to try Hesk helpdesk system.